This is a bulky weight hat that fully covers the ears with the brim turned up or down. The purple brim, and pale blue, tan and green are all Corriedale wool. The gray is undyed Jacob wool. 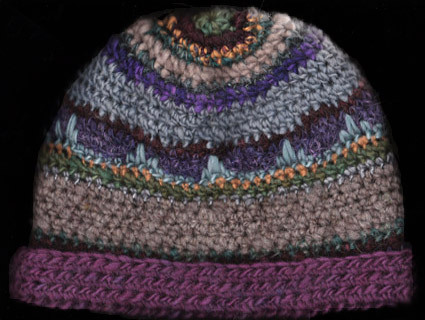 The light blue design work near the center of the hat is a blend of Merino wool and silk. The purple in that same section is llama wool, which makes for a contrast in texture with the blue. The thin gold and light blue gray slightly shinier accent stripes are also silk. The dark burgundy is Suffolk wool, and there are also some teal green and purple accent stripes in llama wool that are hard to see. The purple stripe near the top has some lighter variegation that also doesn't show up well in the computer image. A very fine looking hat for either gender!